So you just bought your first home—congrats! Now comes the fun part: settling into your new digs by filling it with necessary items. But after you spent all that money on securing your new home, you might not want to spend any more on the boring organization and maintenance tools homeownership requires. Save your dough for nesting, and get moving-in done with these essential 12 finds from Home Depot, all under $30. The contents of your old tool kit might not be enough now that you can actually hang up and secure things to your walls without fear of your landlord's wrath. And those DIY projects you pinned years ago? Now's the time to make them come to life. Pick up this introductory drill to get all of those fun projects done easily. Eager to start some projects around your new digs? 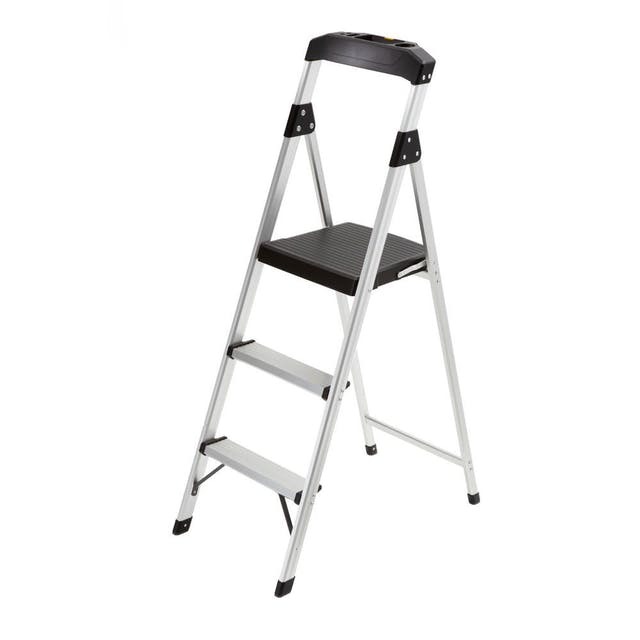 Whether you're wanting to paint the walls, hang some pictures or just install light bulbs, this step ladder will help you get the job done. Arrange, then rearrange your larger pieces without causing any damage to those gorgeous wood floors with these furniture movers. They easily glide over carpet, too. Still unsure about your lighting design plans? Grab this affordable floor lamp to keep your rooms brightly lit until you've made up your mind. With all of the stress that comes after closing, organization is probably the last thing you're thinking about. This affordable over-the-door organizer will keep your smaller items and tchotchkes stored neatly until you figure out their forever home. Brooms, dusters and Swiffers can clutter up the kitchen (or your cleaning closet, if you're lucky to have the space!) Keep these essential tools organized and stowed away with this useful holder. Keep unsightly clutter off of those gorgeous countertops you splurged on with the help of these nifty floating shelves. Their sleek design will also liven up any bare walls you may still have upon moving. Thinking of saving some cash by taking on a few DIY projects around your new digs? You'll definitely want to have a roll or two of duct tape on hand for any home renovation projects (or quick fixes) you take on in the future. Get those boxes unloaded stat by using this basic shelving unit as an emptying space. Once you've found a more permanent solution for your belongings, you can move it into the garage. Bonus: It requires no tools (and not a ton of energy) to assemble. Life inside your new home may be wonderful, but you might not want everyone outside to see it quite yet. Add these faux-linen curtains, which still let natural light shine through but offer the option of privacy when you want it. Let's be honest: There are some things that, despite your best intentions, will not find their place in your new space. Be prepared to stow it away with these must-have storage totes. And don't worry, the containers are clear, so when you do get the urge to pull out that extra throw, you'll know exactly where it is. Phone charger, Google Home, lamp, Wifi router... but only one outlet. Be prepared for electronic overload with this heavy duty power strip. It comes with a 6-foot extension cord, too, so you can even tuck it under the couch or bed before it becomes an eyesore.